As Thanksgiving quickly became a distant memory, we pulled out all the Christmas decorations and began to adorn the house, inside and out. It is a tedious process, pulling out boxes and more boxes, shuffling glass ornaments, and let's not forget the headache-provoking lights! What is it about those lights every year? You plug them in to check if they are working and only half the string is lit... Jiggle the cord a bit, and like magic, they all light up. Encouraged, we put the string on the tree, decorate, and a day later, that section on the tree is dark. Ugh! In an effort to break away from the busy-ness of decking our halls, we fled to Hamilton, New Jersey to be a part of the Lights On! Winter Wonders Weekend at Grounds For Sculpture. Ablaze with twinkling lights at this time of year, Grounds For Sculpture is a 42-acre public park filled with contemporary sculpture to foster an appreciation in visitors of all ages. The outdoor collection is permanent, and there are featured indoor seasonal exhibitions to explore too, as we did this summer. On our return visit, an hour-long wait for a horse-drawn wagon ride enabled us the choice to stroll along the park, sipping hot apple cider and warm cocoa in the dark, fascinated by the trees and buildings dazzling with thousands of fairy lights and holiday magic. The day before Thanksgiving is reserved for feast preparations. Having adopted the hosting, I've learned to cook the majority of delicacies on Wednesday, leaving the turkey and a few sides for the big day. After all, I want to spend quality time with my family and friends who will join us, not hovering over the stove, missing all the fun. As for many, this celebration officially kicks off the Holiday season in our household. While we will be adorning our home starting Friday in color-rich Christmas splendor, left-overs fuel our energy, leaving more time to decorate without eating it up in the kitchen again. Sixteen years... Little did I know back in 1995, single in a one-bedroom apartment, deciding to tackle a turkey for the first time, it would herald the moment my mother officially passed the torch to me. Many years since have afforded my family the grace to continue tradition and blend freshness into the mix. Preparing Lemon Meringue Pie... a tart and sweet treat! I am hosting a little something this weekend... and you are invited! One of a kind artisan jewelry, art-to-wear apparel and exquisite sweaters, accessories and children's gifts will be available for purchase... Try your luck to win the featured gift package raffled off too! My daughter, Brenna, volunteers each week at the shelter / thrift store C.A.T.S. 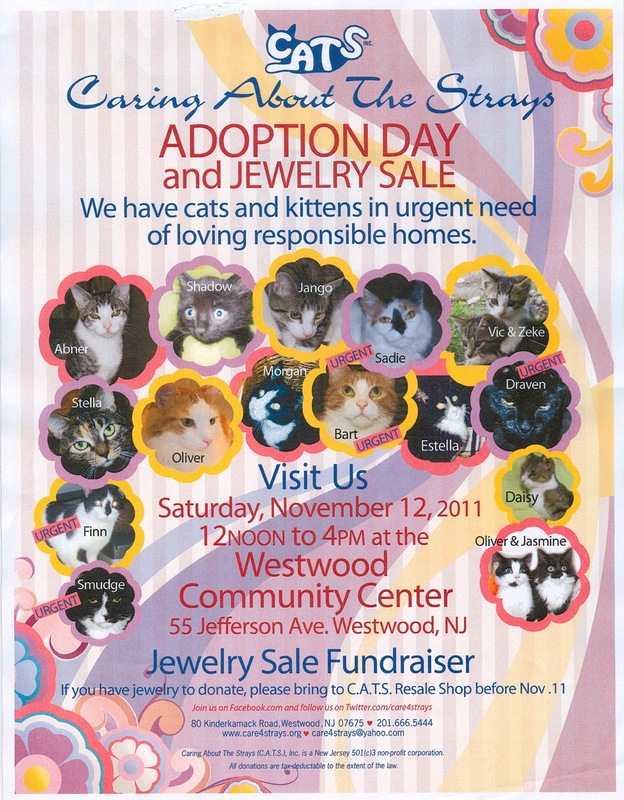 (Caring About the Strays) in Westwood, New Jersey. 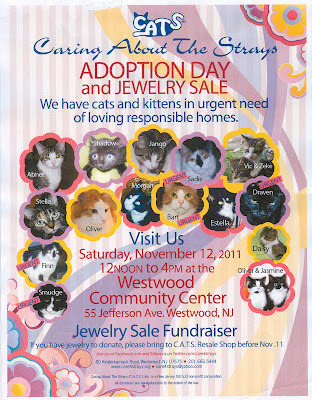 There are many affectionate animals in need of loving homes being fostered at the shop right now. If you are in the area and can attend the event tomorrow or know someone who might like too, please kindly pass on the info. Thank you so much!